That’s the gist of Alexa Guard, a new feature from Amazon that lets your Echo devices keep an ear out for trouble when you’re away from home. If Alexa hears something after you’ve put her into Guard mode — a smoke alarm ringing or the sound of shattering glass, for instance — she’ll send you a notification. If you’re an ADT or Ring subscriber, she’ll notify your home security monitoring service, too. Another feature: If you want, Alexa will cycle your smart lights on and off while you’re away to make it look like you’re home. With far-field microphones in every Echo device, Alexa is already a pretty good listener. Alexa Guard puts those mics to use by listening for the sound of glass breaking or the sound of alarms when you aren’t home. And, my early impression is that it works pretty well! I didn’t have a spare window to smash at my place, but I played a YouTube video of glass break sound effects near one of my Echo devices, and immediately received a notification on my phone that Alexa heard something that sounded like glass breaking. The same thing happened when I tested with the sound of a smoke alarm going off. Amazon’s algorithm doesn’t seem to be as advanced as that, but it’s still an additional layer of protection while you’re away. And when Alexa hears something, her notification offers the immediate option of using Drop In to listen through your Echo device. If you wanted, you could even broadcast yourself telling the potential intruder that you’re calling the police as a means of scaring them off. That last bit is really important. Say you’re out on vacation with Alexa Guard turned on. Your Echo device at home hears the sound of your smoke detector going off, and Alexa sends you a notification. Unfortunately, you’re playing in the hotel pool with the kids, and you miss the notification. Alexa won’t act on your behalf at this point the way a professional monitoring service would. It’s on you to see the notification and act accordingly. That said, with Ring, Amazon says that users can request dispatch of emergency responders directly from the Ring app if they are subscribed to the Ring Protect Plus plan. And if you’re using an Alexa-compatible home security system that she can already arm and disarm with voice commands, you’ll be able to set it so that happens automatically whenever you turn Guard mode on and off. And if you’re disarming your system, she’ll still ask you for a numerical PIN code before doing so. That’s a touch that saves you from needing to give two separate voice commands as you come and go. Just say, “Alexa, I’m leaving” when you’re walking out the door, then “Alexa, I’m home,” followed by your PIN code when you return. Along with listening for trouble, Alexa Guard will let the assistant toggle your smart lights on and off while you’re out to make it look like you’re home — and potentially deter any would-be burglars from attempting a break-in. You can enable the feature with a single tap when you’re turning Alexa Guard on in the Alexa app for Android and iOS devices. Once you do, the app will list all of your smart lights and include them all in Away Lighting by default. If there are any you’d like left out, just uncheck them. The feature asks for your zip code when you’re setting it up — Alexa uses that zip code to know what time sunset is in your area each night. Away Lighting will only run when it’s dark out. From there, you should be all set. When Alexa Guard is active and set to Away mode, your lights will automatically cycle on and off. The feature worked well when I tested it, and was even smart enough to automate some lights in tandem where it made sense — “Bedroom Ceiling Light 1” and “Bedroom Ceiling Light 2,” for instance. I didn’t need to set that up; Alexa just figured it out. I also appreciated that the Alexa app gives you a detailed rundown of Alexa’s automated moves during Away Lighting. That’s good for micro-managers (and, admittedly, for guinea pigs like me that want a closer look at what Alexa’s up to). While Thanksgiving is put to bed for another year, the holiday season proper is only just getting started. What better than the best home automation tips for gifts and holiday decorating? The run-up to Christmas is the ideal time to invite friends and family into your glimmering smart home. Whether you’re relaxing, partying, or you just want to show off your 65-inch TV, how can you make things even better? Well, putting that tech to work can make your life easier and give you more time to focus on playing host. Automation can also help you ramp up security and helps you to head away on vacation without worrying about your home being broken into and your precious smart devices stolen. We’ll launch straight in now and give you a brief overview of how to make that tech sing and dance for you, almost literally in some cases! Our core focus today centers on the twin pillars of the quintessential smart home: convenience and security. You can layer up products to make your home much safer and less prone to a security breach, but since it’s the holiday season, we’ll be layering on more on the convenience angle of automation. While most burglaries take place in summer, that’s no reason to get complacent over the looming holiday season. With so many households now ordering gifts online – here at Smart Home, most of us do the bulk of our gift shopping online – those incoming packages make potentially easy pickings for the opportunist thief. Unless that is, you invest in a video doorbell camera. Now, this type of device only acts as the first line of defense – we’ll look directly below at how you can ramp things up further – but it’s a highly effective starting point. Obviously, the average thief is highly aware of exactly what smart home devices look like. They’ll be only too familiar with a video doorbell and what you do think is likely to happen if they spot a package at the same time they clap eyes on the all-seeing eye of a doorbell camera? Runoff in search of easier pickings! There’s also the added bonus that you can liaise with couriers remotely to avoid the package being dumped somewhere risky in the first place while remaining in full control of your smart home’s entrance wherever you happen to be. If you want to prevent break-ins over the holiday season and throughout the year, a video doorbell won’t do you much good. There’s simply no substitute for a comprehensive home security system. Smart security cameras come in at a range of price-points suitable for pretty much any budget. Thanks to the Internet of Things and improved cellular coverage, it’s now quite possible to install fully wireless cameras with no need whatsoever for a landline. Whether you want a full package with professional monitoring – ideal and super-convenient for many homeowners – if you’re renting or simply dislike being locked into contracts, you can go it alone while still keeping your smart home and its contents fully safeguarded. Why not pop a security sign in your garden? Make it absolutely apparent to any intruder that they’ll be caught on camera long before they gain access to your home and that the police will be alerted to their unwanted presence. As much as we love tech, it’s a smart move to mix in some more traditional methods. With your smart home fully secured for the holiday season, it’s time to think about home automation for the sake of convenience. Smart locks simply replace one form of a lock with another, often slotting over your existing deadbolt so security is surprisingly not the main purpose of these slick devices. The primary purpose of smart locks is to make your life easier so how about adding to that with a dose of fun when party time comes around? August Smart Lock allows you to assign temporary virtual codes. Rather than spending your party running back and forth from the front door to the den, why not send out entry codes with your invites and allow guests to let themselves in instead? If that sounds like too much hassle, you could always grant them access in-app as they arrive. Either way, stay in the thick of the action and let the tech do the work for you. This is exactly what the best smart home should do… automate processes that are otherwise tedious. And the best thing? 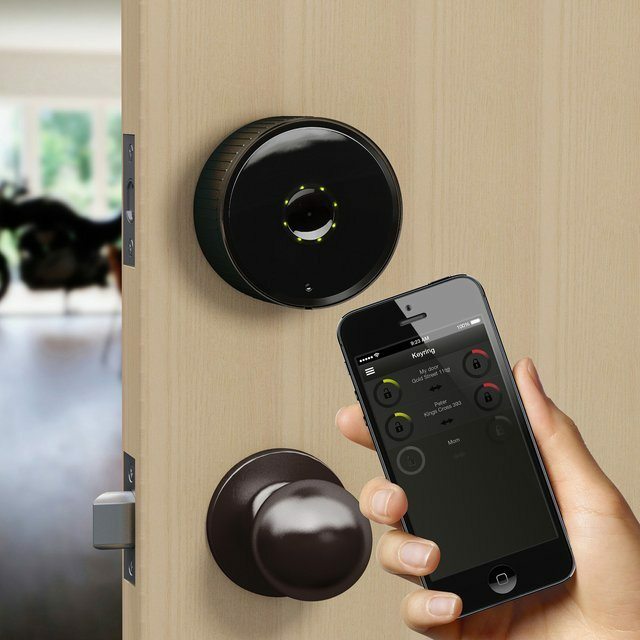 Once the hangover from the party has vanished, your smart lock will still be in place. If you’ve got some lighting out in the garden, why not consider some weatherproofed on/off modules so you can avoid the need for manual control? You can apply this same principle to your lights and decorations indoors so you’ve got all that lighting covered and you can automate it sidestepping any need for manual input besides setting it up in the first place. Once the party has started, you can get a little more creative on the lighting front. You can use smart strips and feature framing from the Philips Hue range along with the classic ambiance lighting so you can set the mood for your party without needing to lift a finger. Use If This, Then That to create lighting recipes to suit and take advantage of colored bulbs to inject some fun into the proceedings. Imagination is your only limitation when it comes to automating your lights over the holiday season so what are you waiting for? Get started and see what other ideas you can come up with! As an aside, you can automate your smart lighting so your home looks well lived-in when you’re taking a well-deserved break in the Bahamas. Take full remote control in-app on your cell phone or program routines so you can leave your phone in the hotel room and disconnect for a while. Either way, you can sleep easily knowing your house won’t be pitch black every night and an open invitation to any opportunist thief. Perhaps the key and the cornerstone to automating your smart home devices and getting them all to communicate harmoniously regardless of protocol is a solid smart home hub. If you haven’t already invested in one, the holiday season is the perfect excuse to put that to rights. Whether you roll with Samsung’s classic SmartThings hub, a Wink gateway or even a smart speaker, enter 2019 strong with the foundation of a fully automated home in place. The holiday season is all about great food with the ones you love surrounding you. Smart displays like the mighty Google Home Hub are the ideal tool for checking out recipes and being led through instructions step-by-step to simplify cooking no end. You can even get recommendations on the home screen if you’re stuck for inspiration and the time is ticking before your guests start arriving. With smart technology, these suggestions are seasonal and you can save them into your own personal cookbook using voice commands. With the basics in place to help you prep your food hands-free even if you’re not the greatest or most experienced cook, you can smarten things up further by treating yourself to the Traeger Timberline 1300. This smart pellet grill lets you access a vast database of recipes and afford you remote control of the temperature and timers so you can stay connected to your guests while also remaining connected to cooking duties even if you’re not in the kitchen. Smart scales and precision WiFi cookers can also take a great deal of the sting out of those tedious jobs so you can spend more time relaxing and less fussing over ingredients. As we edge toward 2019, these automated helpers are only set to increase in scope and by 2020, you might even have some form of robotic assistant to roll out as the ultimate party piece. If everyone is scattered around the house, simply mute the TVs and music in-app so you can make yourself heard and let everyone know it’s time to chow down. Create a dining room scene so the lights are tailored accordingly and your holiday playlist kicks in. With a smart thermostat in place, the temperature is dialed in without you needing to constantly fiddle with a manual alternative. All that remains is to crack open the wine and enjoy all that lip-smacking food with your nearest and dearest. Automation can come fully to the fore for your seasonal entertainment. The home theater is the ideal forum for tech giants to really push the boundaries of seamless, effortless viewing. Whether you’re wowing guests with your sleek new projector or 65-inch TV, ensuring that your soundbar provides fully immersive audio to bring any movie fully to life or you prefer in-wall speakers for a subtler approach, make your home theater the centerpiece of your smart home. Ensure this is one space where you don’t need to lift a finger, and you can kick back fully with friends and family. In terms of general TV, take full advantage of affordable streaming devices like Apple TV, Roku, or Fire TV so you can once again let that technology do all the hard yards for you while you watch the latest series that’s got you hooked. The sky really is the limit in terms of automation in this arena, so let your imagination run wild and buy whatever your budget will stretch to. Music is a staple year-round but all the more so when the holiday season is in full swing. You can harness the full strength of your smart speakers and your favorite streaming services to take charge of party music with voice control. Even if you need to shout commands across a crowded and noisy room, Alexa is getting better than ever at picking up those instructions. If you’re an Amazon Prime member, enable the Christmas skill and ask your virtual butler to play those festive tunes. You can keep things simple as well by allowing guests to play DJ. Just let them connect to your soundbar or Bluetooth speaker using their smartphone and you can allow everyone to play a part in automation. Whichever way you choose to play it, the days of hustling back and forth to change records or swap CDs is dying the same death as non-smart homes as we push toward 2019. Once the last guests have gone, what are you left with? A trashed smart home if the festivities have been more boisterous than you expected! Automate your cleaning with a robot vacuum and you can enjoy breakfast in bed and ease into the last few days before hitting the office while the robot vac does all the tedious work for you. We hope you’ve found some real gems in this guide to home automation for the holiday season and on into 2019. Happy holidays! Being an Airbnb host can be simply great fun and rewarding, or leave you in disgust with a ‘never again’ feeling. Very few hosts will feel worry-free without having at least some insight into their guests’ stay. As a host, one thing you can do to keep an eye on things — without being too snoopy — is to install a few smart gadgets around your space. Here are seven essentials every Airbnb host should consider. 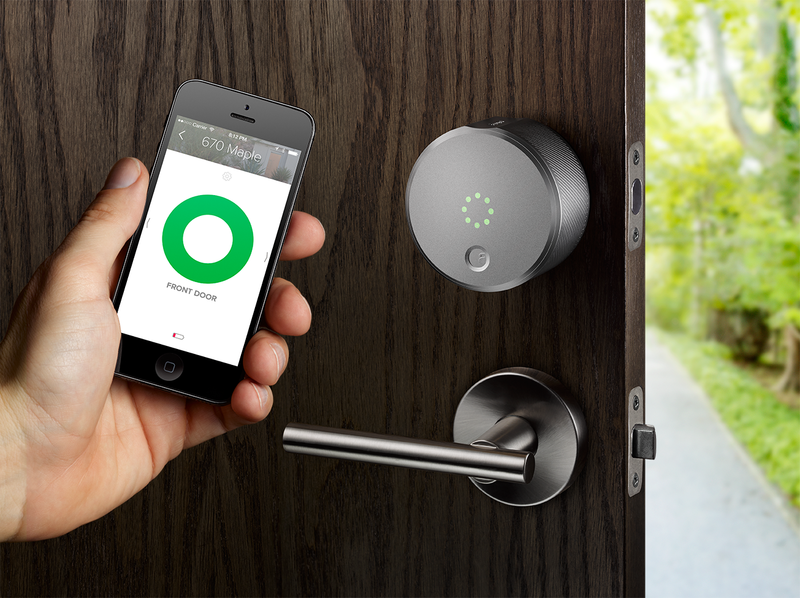 With physical keys, you run certain risks that could be avoided altogether with smart locks. Physical keys can be copied, of course. But it can also be a little more difficult to enforce check out times, especially if your Airbnb property isn’t nearby or if you’re out of town. 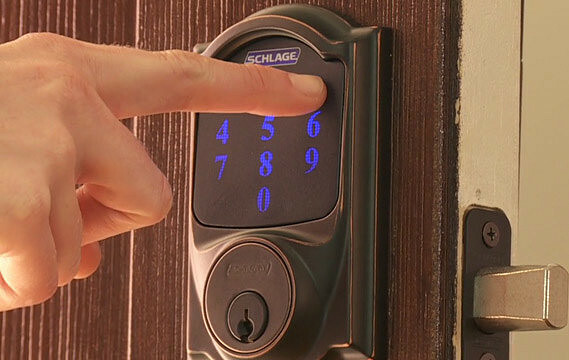 With a smart lock, like those from August or Schlage, you can give temporary access that begins with check-in and expires after the check-out date and time. You can also assign different access codes to guests and others (such as cleaners) to see who is entering or leaving the property. Unlike controlling when someone has access to your Airbnb, it can be difficult to police how many people are staying. If you charge additional fees for extra guests, you probably want to know how many people are actually crashing at your place when you’re not there. Or if you have a strict no-pet policy and suspect a guest might be sneaking in a furry friend, you’d probably like a way to check on that. You can monitor who is coming and going with something like a video doorbell. SkyBell or the August Doorbell Cam come to mind. This is also a nice failsafe, in case the guest loses or forgets their access code or their phone is dead and they can’t unlock the smart lock. They can simply press the doorbell, which will give you two-way audio (and one-way video) communication with your guests and you can unlock the door for them. With a smart thermostat, you will never have to run by your rental to turn on the air conditioning before a guest arrives or off after they leave again. Something like a Nest or Ecobee can determine when people are at home or away and adjust the controlled air respectively. And a thermostat as simple to use as Nest can make it easier for your guests to make themselves comfortable. These simple automation will save you a lot of hassle and some energy costs over time, especially if your rental remains vacant for extended periods. Smart bulbs are more tricky. They continue to work as normal lights, even without a phone app to control them. But without something like an Alexa or Google Home speaker or dedicated controller, guests won’t get to enjoy the full benefits of having bulbs that can change colors or operate on a schedule. The perks of smart bulbs are more for the host than the guest, however. With connected lights, you can see if a guest happened to leave lights on when they checked out. Or you can set the lights to a schedule to simulate someone being home when the property is vacant. You definitely don’t want to make your guests feel uneasy, but most will understand if you equip your space with security cameras both indoors and out. Security footage is one of the few protections Airbnb hosts have against theft. Investing in something like Nest Cam Indoor or Axis will be well worth it should something ever go missing or if anything expensive gets damaged. If you go this route, just make sure you clearly list that they’re present and working on the Airbnb listing and keep them out of sensitive areas, such as bedrooms and bathrooms.